Conjoining music, poetry with visual art was a logical step in the climate of the time and the early 70's saw a variety of gigs by Lady June, writer, painter and eccentric, who in her travels around the Mediterranean had met Soft Machine's Kevin Ayers and Daevid Allen in the burgeoning hippy scene of Mallorca. Leprosy' and eventually be published by Virgin Books in 1975, sell out and run to a reprint. A creation of pooled talents unfettered by hype, personality or commercialism, the larger part of the music and production of the album fell to Kevin Ayers whose career was at its most commercially successful. 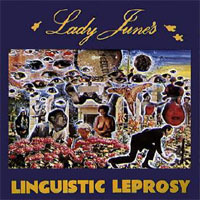 The gentle approach of 'Linguistic Leprosy', surrounded by his oldest friends, finds him relaxed and enjoying himself. The diversity of June's vocal delivery is matched throughout the album by a charming and eccentric array of musical soundscapes from the acoustic inputs of Ayers and Pip Pyle to the ambience of Eno and David Vorhaus.